How would you like to be able to identify colors in 10 languages? 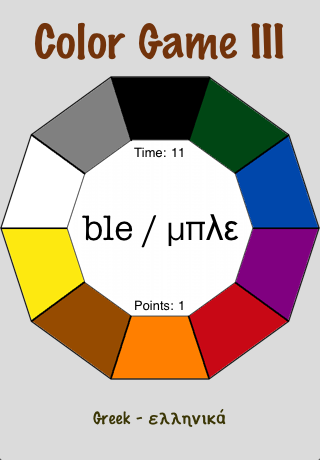 The Color Game III is the third in a series of color language games that enables you to recognize colors in 10 of the most common languages. Once you pick a language you'll have 30 seconds to pick the right colors. Natives of each language can get over 40 points in this game of fast reaction times and basic language skills. For extra fun: challenge your friends and family to beat your score in the language of your choice. To get the latest information on new products, discounts and free app download events please send an email to apps@bidbox.com with the subject line: "Insider News"